This is caused by a lesion of the cervical sympathetic chain. The following signs are seen on the ipsilateral side. 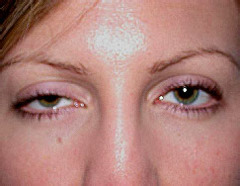 Partial ptosis of the upper eyelid (weakness of Mueller muscle) and some elevation of the lower lid (“inverse ptosis”). Constriction of the pupil, miosis, accompanied by pupil dilation or delay after a light reflex (dilation lag). If damage to the sympathetics occurs early in life, pigmentation of the iris may be affected. Horner syndrome occurs with ipsilateral mediastinal tumor and has been reported with spontaneous pneumothorax and brainstem stroke. The pupil lacks the ability to constrict from either light or accommodation.